B U B B L E G A R M: Do the french braid.. In a hurry, want to look put together and not damage your hair? Yep, that's me. I almost straightened my hair this morning, and then thought "no, it's not worth it" I can't use it all the time, and wanted to do something heat free. Do you do the french braid? What are your favourite heat free hairstyles? 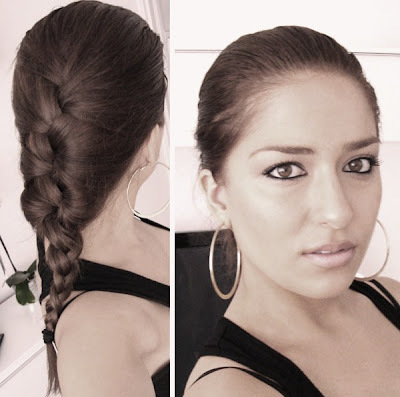 A side fishtail braid or french plaiting the front of my hair then tying the rest back in a ponytail or bun. It looks really good! and like you say MUCH better for your hair. My failsafe hair would be towel dried hair in a bun while I put my makeup on then at the last minute take it out and run some Naked frizz serum through it. Nice soft waves that look similar to when you use a large conical wand. unfortunately, i always have to blowdry my hair (and straighten my bangs). otherwise it's a hot mess (too flat up top, too big at the bottom. i look like a pyramid!). I usually go to the salon for this look they usually start from my very hair line. This looks very beautiful and simple.A fishtail look always grabs attention. Beautiful. This is absolutely GORGEOUS ! love the braid on you! i usually throw my hair up in a messy bun or do ponytail with mega volume when it's too hot to bother. my hair is this wavy mess if i don't touch it and let it do its own thing. Aside from wearing a hat, i put it in a loose pony tail, mid length and booby pin the little bugger until I'm happy with it. How on earth can you reach around and do that? I can barely braid my hair in the front, let alone in the back where i can't see a thing! Anyway looks gorgeous dear, and yay for not putting heat on your hair today! nice braid! i had a hard time trying to figure out how to do it and i still failed to do so..
Looks gorgeous. I've been able to do French plaits since I was about 8 so that's always an easy heat free style for me. I also wack my hair up in a bun if I can't be bothered with drying/straightening. I love plaits but can never do them myself. I'm really into wearing a top knot really high at the moment- easy to do and it takes about 3.9 seconds! You look soo pretty! That hair do (all taken to the back) really suits you. When I feel like it, I do this.. I usually just brush it out, and either wind it into a bun or pull it into a side ponytail. Muhsine, I love your french braid. It reminds me of my go to hairstyle which is a dutch braid. So, basically take your braid and turn it inside out. @Parisa That's gorgeous, I don't do the dutch braid that much, I must try! i've really been getting into air-drying my hair during these hot days :) I use two clips and put it into two bunches - cute for the daytime and when you let them down in the evening your hair is lovely and voluminous and not uneven like it sometimes is when you put it in a single bun! Love that look on you! I totally love it. Very rad! I do this twist tails thing. I have pics on my blog. I think It is cute enough to wear in public. It is great to sleep in, I'm a mover, I can sleep on my sides and back. Best of all it is super fast and easy.